In this world of pointless concerns for things such as successfulness and its contrary, the instinct of self-preservation, the thought of entertaining (let alone actively pursuing) the thought of opposing the system that facilitates the acquisition of status is deeply troubling. It is easier to repress any thoughts that cause to our social success—the way we chase away a nasty fly—than to exercise our function as interrogative beings by asking ourselves whether the hum of the fly makes any sense at all. But the instinct of self-preservation should teach us that struggling for success and maintaining it are counterproductive to one’s wellbeing and safety. As that visionary man, Isaac Asimov, had it long ago, “status won’t sit still under you; you have to continually fight to keep from sinking” (Prelude to Foundation). If that is the case, why does the instinct of self-preservation fade away before the self-destructive pursuit of successfulness at all costs? I believe that the answer rests with an innate trait of our species, namely, our curious will and capacity to transcend ourselves, obstacles, and boundaries. Left unchecked, this trait can ruin us. History teaches that when we listen to this inner call we can achieve much, especially when wisdom is added to the mix, but that when we pursue our goals for the thrill of it we end up suicidal. Pursuing success is just one of the silly things we did, and do, to keep the monster within alive and well. Self-preservation and wisdom matter no longer. Against this backdrop it becomes less and less likely that we will ever accede to our creative potential, to genuine heroism, including the capacity to oppose oppressive systems, particularly when these systems are what makes possible the acquisition of status, power, authority, money, and so on. Not so is true Christianity. Established upon the self-sacrifice of the Logos, true Christianity is not “the peace of a given place,” as Horia Roman Patapievici put it in Omul Recent. True Christianity builds itself heroically, against the world, against utopias, including its own utopias, against selfish drives, against the instinct of self-preservation, against conformism. Understanding that no system—regardless of how convenient it may be, personally and socially—can guarantee a holistic and wholesome development of humankind, true Christianity adopts a critical attitude towards all social systems. Its vocation is not to canonise and worship a certain social, or political, formula or another. Its vocation is to consciously, deliberately, and wisely foster opportune and creative imbalances, moments of crisis, times for assessment. True Christianity defies any tendencies towards systemic mineralisation, refusing to grow complacent with the circular rhythms of stagnation. No wonder therefore that all who have taken Christianity seriously, not its facile and conformist versions, understood that they had to put on the yoke of a prophetic or critical attitude towards the social systems of their times, whether these were within or outside the Church’s backyard. We call these people martyrs and confessors, but we do not grasp either their message or their legacy. Saint John Chrysostom (d. 407) was providentially promoted to the archdiocesan throne of Constantinople in circumstances when Christianity was becoming merely a steppingstone for the socially ambitious who were, then as much as today, deprived of spiritual criterion, moral scruples, and common sense. This was a time when the world clumsily sought to confirm to the standards of the Good News it could not comprehend. This was also a time when within the ecclesial microcosm golden people and wooden chalices were overnight replaced by wooden people and golden chalices. Heroically, Chrysostom resisted the temptations coming with his status and successfulness. He stood against the tide. He was well aware that the term that designated his ecclesial function, bishop or rather episkopos (Gr. supervisor, overseer), entailed a prophetic component. He knew that he could not supervise the ecclesial life, the wellbeing of God’s people, without spiritual discernment and that he could not exercise this charism without personal costs. But he was a true Christian. He embraced the risks without reservation. He transformed his episcopal palace into a shelter for the unsuccessful of the world, for the oppressed, for the poor, for the sick—all those whom the society of the indecent successful either marginalised or forgot or despised. He humbled himself, living in simplicity and tacitly opposing the tragic transformation of Church’s shepherds into imperial dignitaries, into successful people endowed with social status and power. Unlike so many princes of the Church in his time and our own, he did not allow himself to be absorbed by the system, refusing the vain company of the civil authorities, of the rich, and of the powerful. He endeavoured, in word and deed, to remind the Church and the world about the things that truly matter, compassion, goodness, and righteousness in Christ. He paid the personal price. He was exiled and died in exile. In the eyes of the successful, he failed. Not in the eyes of the Lord. Nor in the memory of God’s people. In the footsteps of the Lord whom he loved, Chrysostom was then, and so remains to this day, a strange bishop. Like Christ himself who was aware of his mission and pursued it to the end, he knew why he was promoted to the episcopate and what was the price to pay in order to exercise his prophetic charism—out of love for God’s people, not in the way of the world. Chrysostom was fully aware that the preacher of divine wisdom against the cunningness of the world cannot escape the only destiny available for those like him—the reiteration, again and again, of the theodrama of the Lamb slaughtered from the foundation of the world. Humbly, he accepted it. He was not wounded by the spear of social successfulness. In his turn, like many true Christians before him and after, he trampled down death by death, saying, “glory to God for all things.” For which, unworthily, we honour him. Acknowledgment. This is the English translation, slightly adapted, of an essay originally published in Romanian, in Bărăganul ortodox (a periodic of Diocese of Slobozia and Călăraşi) 54 (2007) 3. 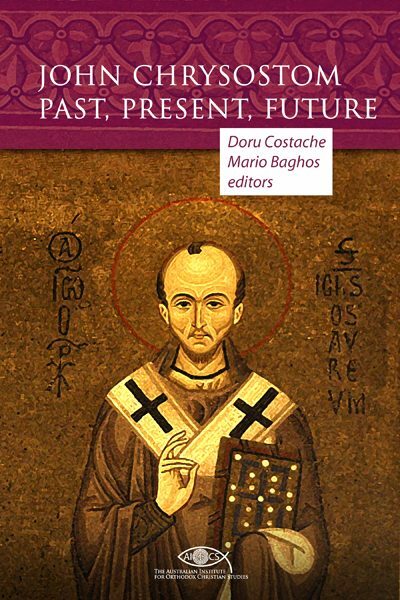 On this day when we remember the return of Saint John’s relics from exile, I dedicate the reissue of this essay to the memory of the great shepherd Bishop (Professor Dr) Damaschin (Damascene) Coravu of Slobozia and Călăraşi (d. 2009). I remain grateful to him as one of the only two Romanian bishops who showed both spiritual discernment and prophetic courage to publish my work in times when I tasted the bitter bread of “brotherly love.” Memory eternal, my Father. 27 January 2019 © AIOCS. See also John Chrysostom: Past, Present, Future. And here is the original Romanian version. Pe urmele Domnului pe care l-a iubit, Hrisostom era un episcop straniu atunci, ca şi azi… Precum Hristos însuşi, el ştia pentru ce a venit în lume şi care erau costurile pe care trebuia să le plătească pentru a-şi ţine rangul cu demnitate profetică, din dragoste pentru poporul lui Dumnezeu… Hrisostom era conştient că predicatorul înţelepciunii dumnezeieşti împotriva noimelor deşarte ale lumii nu putea scăpa singurei perspective posibile pentru cei asemenea lui—repetarea, iară şi iară, a theodramei Mielului junghiat de la întemeierea lumii… Şi a acceptat, smerit. Nu l-a rănit suliţa succesului social, ci a călcat, la rândul său, cu moartea pe moarte… Pentru care, cu nevrednicie, îl cinstim. Acknowledgment. Textul românesc original este cel publicat în Bărăganul ortodox (periodic al Episcopiei Sloboziei și Călăraşilor) 54 (2007) 3. În această zi când cisntim întoarcerea rămășițelor Sfântului Ioan din exil, dedic republicarea acestui eseu memoriei marelui păstor, Episcop (Profesor Dr) Damaschin Coravu al Sloboziei și Călăraşilor (m. 2009). Îi rămân recunoscător ca unuia din cei doi episcopi români care au arătat atât discernământ duhovnicesc cât și curaj în publicarea scrierilor mele în timpuri în care gustam pâinea amară a “iubirii frățești.” Veșnică pomenire, Părintele meu.